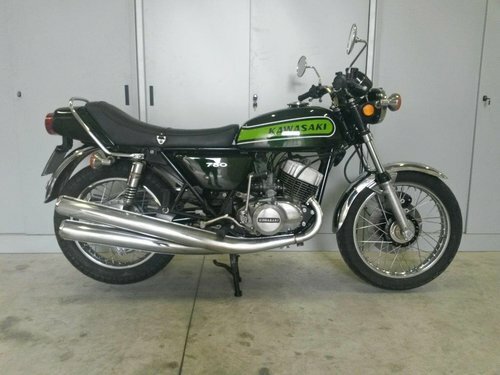 A real gem, the Kawasaki 750 H2, also known as Kawasaki 750 Mach IV, is a very beautiful and perfectly working model, a motorcycle model produced by the Japanese Kawasaki, in four successive series, from 1971 to 1975. 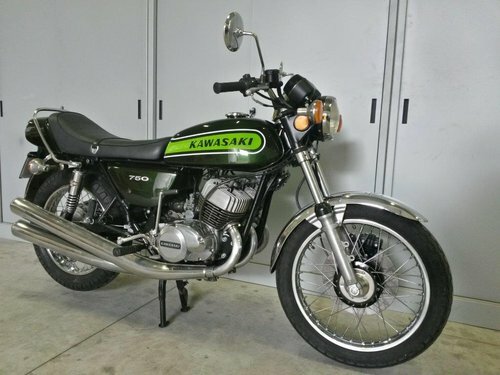 In 1970, given the protraction of the development of the "900 Z1", the Kawasaki was without a product to counter the huge success of sales reaped by Honda with its "750 Four". 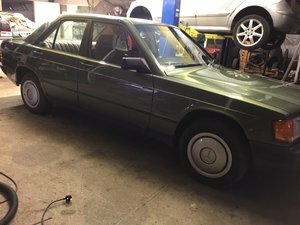 The managers then decided to put into production a transitory model, strictly derived from the "500 H1", well received by the US market as well as the European one, following the same constructive philosophy. 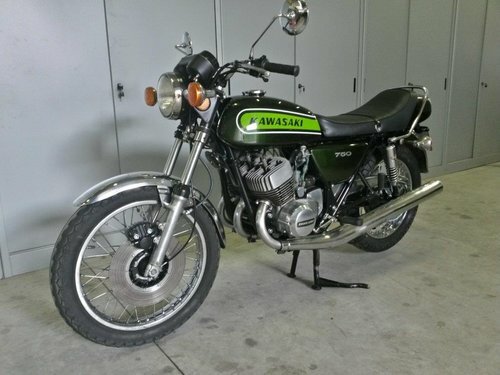 The design and prototype phases of the "750 H2" were therefore very short and the industrialization of the product soon arrived, also favored by the use of many mechanical and cyclistic parts of the model of lower displacement. 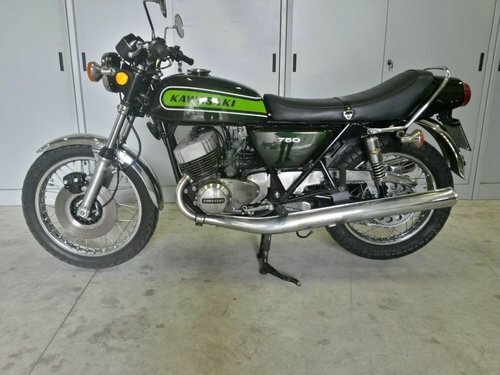 Evolution [edit | change wikitesto] Kawasaki 750 H2, 3rd series of 1974 The second series, called "750 H2A", was put up for sale in 1973 and differs from the previous one only for slight variations to the moldings, for the chrome front fender and for the replacement of the gear shears defective. For the US market gold and purple colors are available, the latter not for the European market. 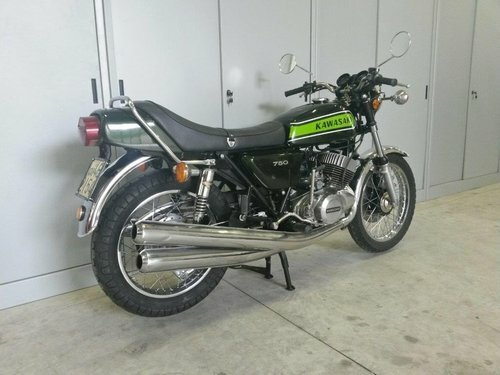 In 1974 the third series was presented, called "750 H2B", which proposes strong aesthetic and structural variations, through the strengthening of the chassis, the increase in wheelbase and the softening of the engine with a power reduction of 71 hp. In essence, the "750 H2B" replicates the modernization designed for the lower model "500 H1D", but in this case the changes are little more than a palliative, leaving the original problems almost unchanged. The colors available are dark green / light green and brown / yellow. 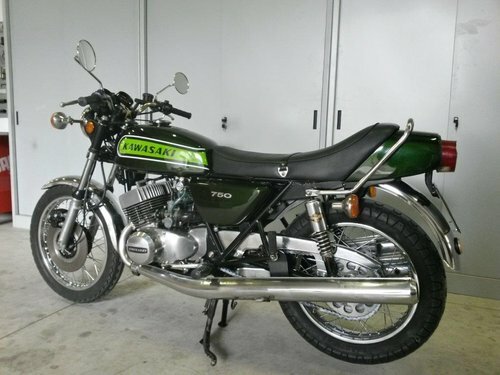 The fourth and last series, called "750 H2C", was presented in 1975 with a small number of slight modifications, especially of an aesthetic nature. The colors change to dark red / light red and dark purple / light purple. The last copies of this series are marketed under the acronym "KH 750 A".